It seems like posting is a once a month thing for me. I really need to start blogging more often. Hopefully, things will change and I will be start posting at least twice a month or even once a week. Since the last time I posted we were living with my parents. Well, nothing has changed, and we are still there. We don’t mind that much, the most annoying thing is living out of boxes. It seems like I can never find anything. Enough about that… I want to share what has been going on in the house!!! We knew from the beginning that we wanted to redo a few things. Some were MAJOR and some not so much. The kitchen was one of the things we wanted change. 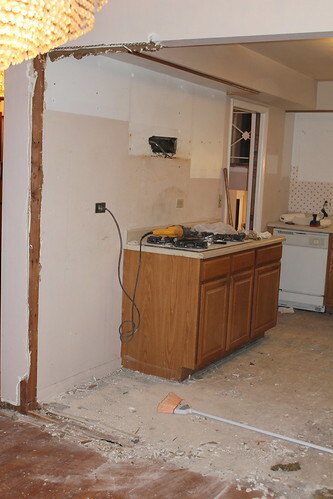 Here is the before of our kitchen. This was taken the day of the closing. What do you guys think?? Not bad, right? Well our parents thought that we shouldn’t change anything. Of course we disagreed. We had dreams for this kitchen. 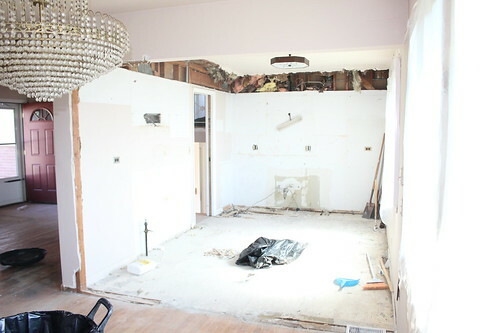 It’s not a big kitchen, but it is one of the places where we will be spending a lot of time. Actually, a place I will be spending a lot of time in according to Jimmy. We started off by pulling up the tiles. It was one of the easiest things to do in this kitchen. Whoever installed these tiles didn’t do a good job. I think within 30 minutes the tiles were up. Throwing away the tiles was the hardest part. 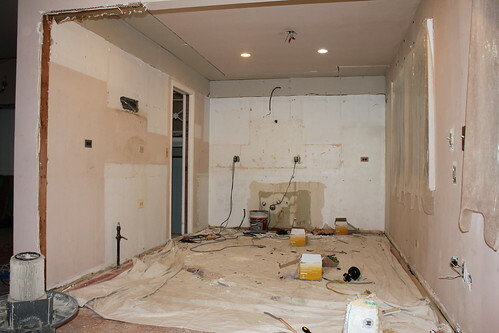 Here’s what it looked like after the tiles were all removed. 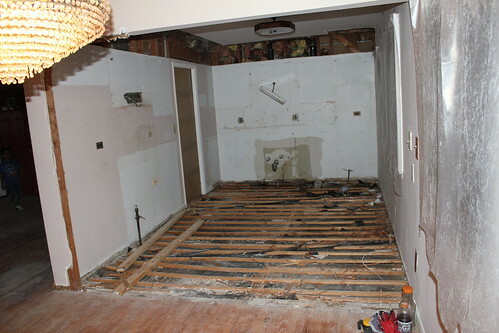 We debated with the idea of keeping the sub flooring that was already there. We figured it would take too much time and energy to take out the sub flooring. It also looked like they were in good condition. In the end we decided that it was worth the time. 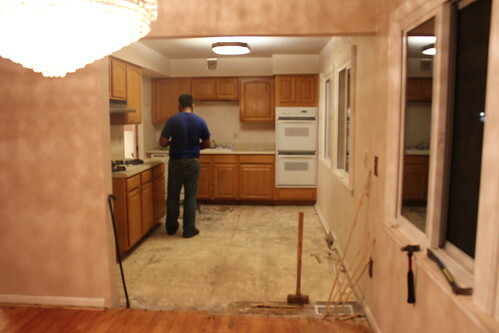 We didn’t want to start off this remodel with uneven floors, and having to worry about tiles cracking over time from the unevenness. Not to mention the kitchen floors were higher than the dining and living room floors. Bye-bye sub floors, we are glad your gone. What do you guys think about the remodel so far? Any guesses on what we decided to do?? 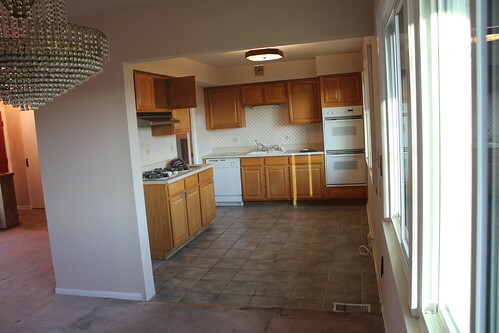 Do you see any potential for this kitchen? It’s an open canvas at the moment. I will post more of the progress next week. Stay tuned! Hopefully you guys will like how its coming along. Let us know what you guys think about the remodel. We love hearing comments. I’m so excited to see how it will look!! Can’t wait to show it….it’s almost done!